First I must say how completely overwhelmed I am at the amazing response to my posts so far. I am speechless! Thank you to all the readers of this blog and all the kind and encouraging comments that have been posted. All comments are so very much appreciated! Both these fabrics are designed by Anna Maria Horner. The fabric on the left is from the "Garden Party" range called Polka Line in Raspberry, and the fabric on the right is from the "Good Folks" range and is called Cathedral in Peony. Oh! It's always a great day when the delivery van stops at my house! Oooh! I can't wait to see what becomes of those. Awesome fabric...can't wait to see what they become!! Wow, are you ever on a roll - what a wonderful introduction to Blogland! You will be inundated with visitors - your quilts and other goodies are spectacular! I love the colors! Yes, it is wonderful to have a delivery, especially when it is fabric. ah yes - i need those dots in lime and slate too! 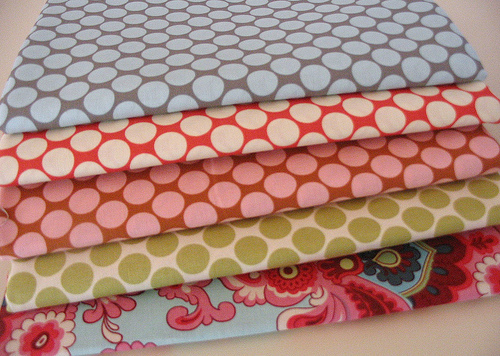 Love new fabric! I want some! Just came over from Twiddletail's blog, and I have to say I love your blog! lovely colors.